The rationale for using HBO in acute traumatic ischemia is to increases tissue oxygen tensions in hypoxic tissues to levels which make it possible for the host responses to become functional. With HB0 at 240 kPa the haemoglobin-borne oxygen content is increased only from 19,8 ml of oxygen per dl blood to 20,4 ml O2, whereas plasma and tissue oxygen tensions increase tenfold. The resulting effect is that oxygen diffusion distance from capillaries is increased by a threefold factor (Krogh19). Sufficient oxygen becomes physically dissolved in plasma to keep tissues alive despite inadequate haemoglobin-borne oxygen delivery20'21. Oedema reduction secondary to vasoconstriction is the second important effect of hyperbaric oxygenation. The benefit of this vasoconstriction that occurs only in non-hypoxic tissue is a 20% reduction in posttraumatic vasogenic oedema and an improvement in microcirculation22. HBO maintains oxygen delivery while the blood flow that contributes to oedema formation is reduced. 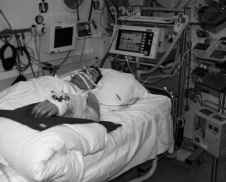 Clinical experience with HBOT in acute traumatic ischemia is growing within the last years. But still there are only two randomised controlled trials of crush injury management assessing effects of HBO (Lindstrom26, Bouachour27). Most clinical reports describe the benefits of HBO in a very subjective way as „helpful", or state that amputation could have been avoided by the use of HBO. In this context it must be admitted that randomised clinical trials are difficult to perform due to the complexity and diversity of trauma injuries. Strauss in 1981 did review the international literature on HBO in crush injuries28. 93 cases using HBO were reported in the English speaking literature, none were controlled studies. They all showed benefits from HBO for traumatic ischemias. Most of the clinical reports were case reports with limited numbers of patients, except the Russian and Eastern Europe reports. The reports of 634 cases from the Eastern European literature included benefits as "positive effects on local reparatory processes," "reduction of tissue damage," "accelerated recovery of neutrophil phagocytic activity," "accelerated diminution in oedema," and "healing without suppuration". The review showed that the more frequent the HBO treatments, the greater the likelihood of success. Shupak et al in 1987 reported that in 75% of the patients who were at risk of limb amputation after acute ischemic injury, the limb was solved using adjunctive HBO29. Only one patient out of 13 did not benefit from HBO. Similar reports come from Radonic30 who treated lower limb trauma associated with popliteal vessel damage using adjuvant HBO. In 1996 Bouachour et al. published a randomized double-blinded, placebo-controlled study of the effect of HBO therapy in the management of severe crush injuries27. Thirty-six patients with Gustilo Grade 2 or 3 crush injuries were assigned in a blinded, randomised way to receive HBO therapy or placebo within 24 hours of surgery and subsequently twice daily over 6 days. 17 patients (94%) in the HBO group versus 10 (59%) in the placebo group achieved complete healing (p<0.01). None of the 18 patients treated with HBO required amputation, but two of the control patients did. Further surgery was required in 1 of the HBO group (6%) versus 6 (33%) in the placebo group (p<0.05). Fracture healing in patients over 40 years of age was significantly improved with HBO (p<0.05). The authors found transcutaneous oxygen measurements significantly improved in the HBO group as compared to the control group. They found transcutaneous measurements a valuable discriminator for wounds that healed completely versus those that progressed to tissue necrosis. In patients with complete healing, tcpO2 values on air rose from 21,6 ± 5,7 mmHg to 90 ± 20 mmHg over a series of 12 HBO treatments, no significant increase in tcpO2was seen after 12 sham treatments. This study has been welcomed as providing randomised controlled trial based evidence both of the efficacy of HBO therapy in severe limb injury and the importance of transcutaneous oxygen values as an objective predictor for wound healing during hyperbaric oxygen therapy. 33 consecutives patients with Grade III crush injuries were treated with adjuvant HBO at the University of Miami/Jackson Memorial Medical Centre from 1999 to 2002 by Matos et al.31. The patients' injuries were categorized according to the Gustilo's classification: Grade IIIA7, Grade IIIB23 and Grade IIIC3. 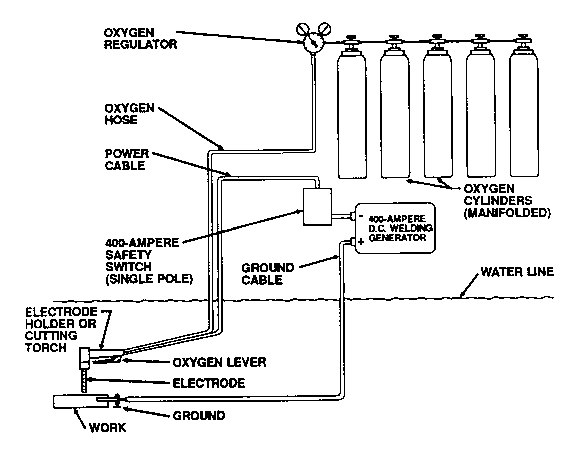 The HBO was delivered in a multiplace chamber at 240 kPa for 90 minutes on 100% oxygen on a BID and QD schedule. HBO was discontinued with the development of a healthy granulation bed or resolution of ischemic changes in tissues. All patients received initial surgical management within 24 hrs. 88%29-33 of the patients had a successful outcome with preservation and good functional recovery of the threatened limbs. The average time from injury to initiation of hyperbaric oxygen treatments was 48 hours and a mean of 15 HBO was performed. Only 48% of the patients required reconstructive procedures (14 STSG and 2 free flaps) to address the soft tissue defect. All four failures underwent amputations (2 transmetatarsal, 2 transtibial). Incidence of soft tissue infection was minimized and osteomyelitis prevented in all cases. • over 40 years old (Gustilo grade IIIB 21 patients, Gustilo grade IIIC 22 patients). Patients' ages raged from 11 to 70 years. Open fractures of the tibia and crush injuries of the hand were most common. Stabilization was mostly done by external fixation. The number of HBO treatments ranged from 2 to 42 sessions (mean 11.7). More than half of the patients were under artificial ventilation when referred to the hyperbaric unit. Even there was no placebo group in this study, the results of an adjuvant HBOT show an excellent outcome. In the upper limb trauma subgroup there was a significant loss of function (ability to work) in only 21 patients, 18 patients kept mild impairments. Major amputations (fingers I/II, hand or lower leg) had to be performed in 8 patients, minor amputations (finger III/IV/V) in 9 patients. All secondary amputations had to be performed in patients with grade IIIC injuries, mostly after primary replantation of an amputated limb or due to chronic infection. In upper extremity injuries the number of severe complications, mainly infections was much lower than in lower extremities. The total infection rate was 31,8% (group c,d,e). The infection rate of grade IIIB injuries was 23,9%, of grade IIIC injuries 40,5%. The rate of severe clinical infections (chronic, repeated debridement and prolonged antibiotic therapy necessary) was 10,2% in total (group d,e). In contrast to Bouachour et al. there was no difference in the complication rates and outcome of patients up to 40 years and older than 40 years. Recent advances in orthopaedic, vascular and plastic surgical management including HBO have seen a move towards attempting limb salvage where amputation would previously have been performed. 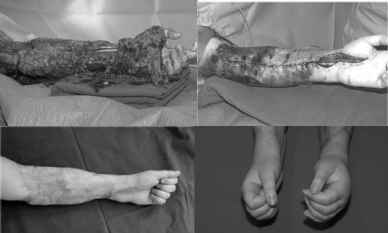 However significant debate exists regarding criteria for early amputation versus limb salvage. HBO could be helpful in distinguishing viable from non viable tissue in those cases. Further randomised controlled clinical studies are required to explore the potential benefit of HBO in acute traumatic ischemia. Of particular interest would be long term outcome data for both the injury and the patient in functional terms. The design of the HOLLT study33, a multi-centre randomized controlled trial of HBO versus non HBO as an adjunct to the normal trauma care will use severe lower limb fractures as the form of crush injury to study the adjunctive short- and long-term effects of HBO.